You can`t beat it for luxury on the beach, at affordable rates for family vacations. After one stay you will be hooked on our `you-can`t-be-closer` accommodations. 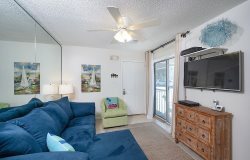 We have a very high rate of return rentals -- so get your reservation in and join the other satisfied vacationers of the `Myer`s on the Beach` condo. We had a great experience, both with the condo unit and with the booking. The unit is wonderful. Myers Properties has made a real effort to create a smooth stay. We particularly appreciated the DVR with the TV so that we could tape programs. This unit is on the west corner, with a wrap-around porch. So it's a terrifically appealing unit, both inside and out. We enjoyed every moment in Sugar Dunes #1. We wish you could take care of the weather as effectively as you take care of your guests! We have been staying at Sugar Dunes for about eight straight years. We love being on the first floor with easy access to the beach. This corner unit is spacious and so very comfortable. We really use the balcony more than anything because of the wonderful breezes both morning and night. Coffee in the morning and drinks at night. The small complex is so quiet and our family hopes to continue in the years to come. As before, I would highly recommend these wonderful people for all vacations. The team members were always very helpful and very nice to work with. We've stayed at Sugar Dunes now three times and would highly recommend it! Beautiful home! This was the third time for our family to stay at Sugar Dunes Condo's and all three times were amazing. This vacation we chose to stay over the 4th of July holiday to experience the fire works from our Condo's. I was hesitant we would be able to see them, but just as they promised we sat on our porch and watched a spectacular show. It was truly amazing!!! They were so nice and such a pleasure to work with. As mentioned above, the lady I spoke with was apologetic when the handle on the sliding door broke rather than having an attitude or being upset that it was broken. She had someone over immediately (Monty) and he was in and out! My family went to stay at Myers on the Beach for a week because my brother was about to deploy and we really wanted to make some forever memories. We couldn't have picked a better place to spend some last minute quality family time with him. This was the PERFECT place for our family vacation. Perfect location. Beds were cozy. Plenty of room. Very well stocked kitchen. Perfect view. Everything was amazing. Oh! And the softest blankets for covering up on the sofa for afternoon naps! Great stay the only negative thing I could comment about would be the construction mess. The Myers team has been a joy to work with. Our internet connection was lost during our stay, but after talking with a team member, the issue was corrected promptly. The fact that we are repeat renters says it all. This is our #1 favorite! Our stay was a delight and we didn't want to leave. This unit had everything you could possibly need. The views are beautiful and you are just steps away from the beach We will certainly be back!